Charlene Blair, 55, stood listening to Nance’s words while holding a framed picture of the ceremonial U.S. 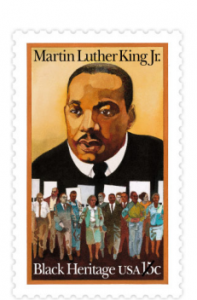 Postal Stamp bearing King’s image, part of a collection she has of stamps of famous or accomplished African-Americans. Blair was a kindergartner in East St. Louis when King was assassinated. Stamp collecting can be enhanced by collecting first day covers, souvenir pages, posters, key chains, coasters and other items with stamps on them. Dragon cards by Lloyd de Vries have been nice additions to many collectors. 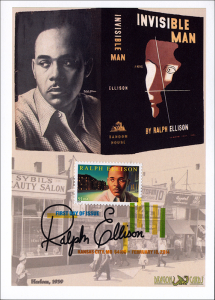 Look at the Ralph Ellison below. 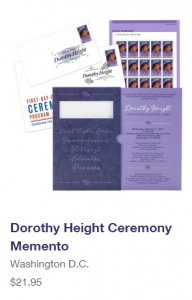 The Dorothy Height is still available at the USPS online. 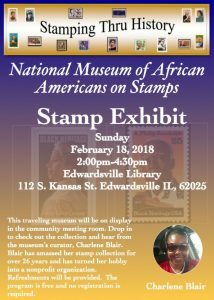 One of the goals of the National Museum of African Americans on Stamps is to be a catalyst for courageous conversations. To support this effort we will have 30 second promos on WSIE 88.7 The Sound. 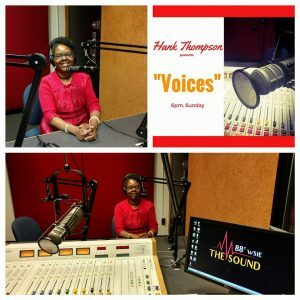 We will appear in the hour before and after “Voices,” an hour-long radio-news magazine hosted by St. Louis radio personality Hank Thompson, that airs at 6 p.m. on Sundays, and focuses on social issues, politics and culture from an African-American perspective. We invite you to listen. 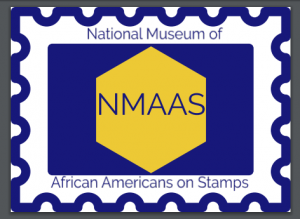 If you would like to support the marketing and programming efforts of NMAAS, please donate on our Facebook page (https://www.facebook.com/TheStampKeeper/), www.paypal.me/NMAAStamps, or send to P.O. Box 303, Edwardsville IL 62025. Thanks and enjoy the music and show. Note: Voices has its own dedicated sponsor(s). NMAAS is not responsible for the guest, views expressed or topics chosen. February 2018 was a busy month. We began with a visit to an elementary school where a journalism club had the opportunity to ask questions and write a report about NMAAS and the hobby of stamp collecting. The winner receives $50 and the opportunity to be published in the St. Louis American Newspaper. 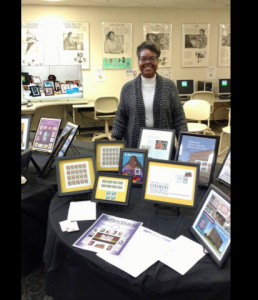 We had a booth at a black business expo on the campus of SIU-Edwardsville and hosted our first exhibit at the Edwardsville, IL Library. Eight tables of items from the personal collection of Charlene Blair were enjoyed by adults and children. The month was rounded out by a visit to the E. St. Louis, IL Resource Library where Charter School students and the community visited the exhibit and heard a brief presentation. 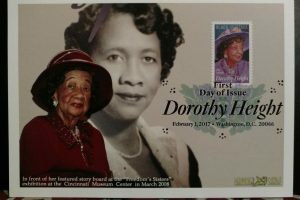 Check out some of the photos shared on the Ebony Society of Philatelic Events and Reflections page – ESPER page. We are excited to see the initiative to preserve African American Spaces. 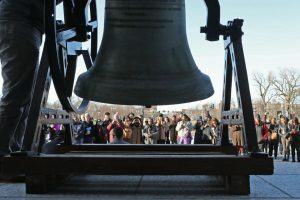 In his article about Historic Preservation, Brent Leggs states, “Along with elevating forgotten places, we aim to reveal the hidden, and sometimes willfully obscured, layers of history at all historic sites”. Below are some of the organizations that may benefit from this project. A non-profit organization that honors the accomplishments and history of African-Americans who participated in air crew, ground crew and operations support training in the Army Air Corps during WWII. Promotes, researches, preserves, interprets and disseminates information about Black life, history and culture to the global community. This museum is committed solely to the study and preservation of African American history. Visitors report that this museum is the most unique and dynamic black history experience. This museum, one of few in the state of Idaho, exhibits, provides educational and outreach programs, and maintains a speakers bureau. We should never forget that it takes a team to execute our best ideas and produce effective change. Furthermore, to portray accomplished African-Americans in an accurate and creative light we need the artists. Barbara Higgins Bond is an artist and designs some of the artwork in the stamps we share on this page. 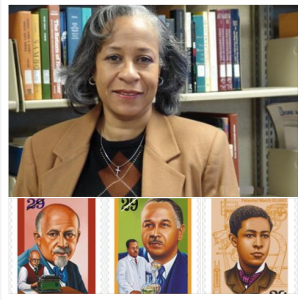 The first African-American female to illustrate a United States postage stamp, she has created outstanding designs for three Black Heritage issues: Jan E. Matzeliger, W.E.B. Du Bois, and Percy Lavon Julian. Higgins Bond earned her bachelor of fine arts from Memphis College of Art. A versatile artist whose work has attracted national attention, Higgins Bond (as she’s known professionally) has been an illustrator and commercial artist for close to 40 years. Her images have appeared in children’s books and on magazine and book covers, posters, album covers, and collectors’ plated created for such prominent clients as Anheuser-Busch, McGraw-Hill, Essence magazine, the Franklin Mint, The Bradford Exchange, NBC, Hennessy Cognac, Frito-Lay, and Columbia House. She also is an adjunct professor of illustration at the Nossi College of Art in Nashville, where she lives. The Metropolitan Museum of Art and the Du Sable Museum of African-American History have exhibited her work. She has received prestigious honors including a medal of honor from then-Governor Bill Clinton. She also has illustrated four stamps for the United Nations Postal Administration. Higgins Bond was the keynote speaker at ESPER’s 25th anniversay in 2013. 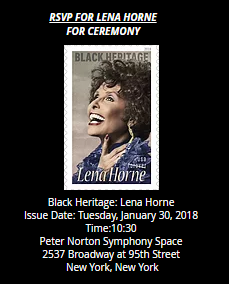 Do you plan on attending the Lena Horne Stamp unveiling? Don’t forget to reserve your tickets. As we start the year, we have been recognizing and celebrating Dr. Martin Luther King, Jr,. – one of the most inspirational people of our time. The civil rights leader left a legacy that we are still striving to achieve. The stamp below was issued January 13, 1979. He is the second stamp in the Black Heritage Series. Click the links to see a brief video and information about Dr. Martin Luther King, Jr.
We are excited to kick-off the year with an exhibit of pieces from the collection at a local library.